You work hard to mow and manicure your lawn. So the last thing you want is for your grass to be destroyed by an easily-avoidable problem. We may turn to a “serious” culprit like lawn disease to blame for our issues. Yet, damaging your grass with everyday wear and tear is easier than you may think. Sometimes the simplest answer is the right one. By following some basic tips, you can avoid the precarious problems below and maintain a beautiful yard all summer long. 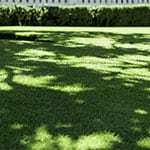 If you want to have a thriving lawn, your grass needs sunlight: not too much and not too little. When your lawn gets excess sunlight you will need to be vigilant about watering the grass. But what can you do when your lawn doesn’t see many rays? If your shaded area is caused by trees, you can try pruning branches to attempt to let more light shine through. If shade is caused by your house or a building, try watering the grass in that area less frequently than the rest of the lawn. Also, when you mow, leave your grass in the shaded area about an inch longer than the rest of your yard. If you think your grass type is a problem, it may be a good idea to plant a more shade-friendly grass like rye or fescue. Perhaps you have an area in your yard that receives virtually no sunlight. In that case, you could consider landscaping that area with gravel or mulch. Foot traffic can wear out your lawn — fast. If you have an area that is treaded over regularly, and becoming thin, try to give it a break and redirect the traffic elsewhere. 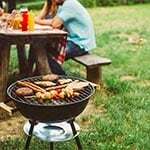 You should reconsider your placement of common objects like grills, lawn furniture, and other items that would cause people to congregate in any given area. Spilling chemicals on your lawn can lead immediately to dead grass spots. Be careful when handling things like fertilizer or gas for your mower. 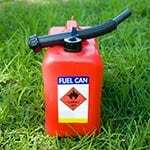 Try to refuel or fill these items away from the grass in a safe place. Something like a no-spill gas can will also help. If you mow your grass when it’s too dry or scorched, it can lead to lawn damage. Conversely, you also don’t want to cut the grass when it’s soggy and leaves clumps behind, which is also unhealthy. Try to vary the pattern in which you cut your grass so that a consistent pattern doesn’t wear down the lawn. When you fertilize your lawn too often, or apply too much fertilizer to one spot, you can create dead patches of grass. Excess nitrogen and salt from fertilizer can actually cause your grass to become damaged or die. This is known as “fertilizer burn.” If your lawn experiences this, you can try dousing it with water after application. Be careful about your fertilizer usage, though, as it is easier to prevent this from happening than it is to find a way to fix it later. Follow these tips and you'll be more likely to keep your grass green and healthy this summer. 6 Common Problems That Kill Your Lawn.. Our Power Equipment Direct how-to library can help you learn about How to Fertilize Your Lawn, Vote for Your Favorite Brands in Mower Madness 2019 and Official Mower Madness Contest Rules.